Anyone watching the film slightly critically and having read The Outsider by Camus would know that the plots are very parallel. It is very deliberate, because the movie seeks to define ‘the modern man’, in light of the literary interpretation of the Heisenberg uncertainty principle (the presence of the observer changes the observed). That is why the title suddenly starts to make sense at a level that is deeper than the first reading of the plot. In the whole movie, there is only one man who knows the complete story, i.e. he hasn’t changed the observed, and that is Ed Crane. Otherwise, seen from anyone else’s point of view, the observed is different from the ‘reality’. Even though, by the end, Ed himself starts to dissolve into the confusion around him, his understanding still remains deeper than the other characters, though he is as much a victim of this confusion as the others. While Mersault was a man who was entering modernity by rejecting and disowning the prevalent morality, exalted by the benign indifference of the universe, Ed Crane was living in a time where the moral atmosphere was, for the lack of a better word, confused. Ed Crane was the modern man, born into a modern time, not one who was ushering in the modern era. He was trying desperately to find his place, and that is why Birdie is so crucial to the plot, as Crane wants her to find herself so he could live through her vicariously. His ambition was to create an impression, to have a say in the future (‘Dry Cleaning: wave of the future’), as he was distraught by the futility of cutting the hair that always grew back (Sisyphus the wisest barber), of having it made and having nothing, of being alienated and anonymous (although I am not too sure about the anonymity part as he was fine with his name not being associated with the business). 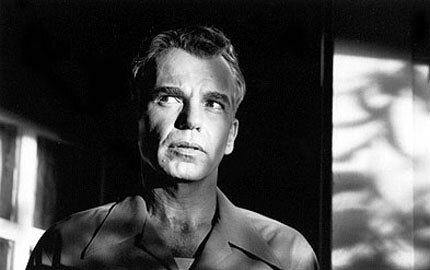 He is, in every sense of the plot, the man who wasn’t there. Mersault says in The Outsider that to him, everyone was guilty (an idea that becomes central to a later work of Camus, The Fall), and it is the same in the film. The crucial difference is that while in the Outsider the guilty were prosecuted for the crimes they committed, in the movie, the crime committed was different from the crime they were being punished for. But like the movie, the sentence meted out was the same. So was, I think, the reception to the punishment. Confused faces could be seen watching Crane’s execution, wondering what it meant to them. Crane, on the other hand, had resigned from the expectation of any epiphany (other than that there was no epiphany here), pinning his hopes on something in the afterlife, refusing to acknowledge the end when it hit him. This is completely unlike Mersault who reconciles with the universe at the end. I am still reeling and not completely decided on what to make of the movie, but the impact is forceful, and it reinforces my belief in the writing prowess of the Coen brothers.